It's April 21 and two things are happening today. First, it's Bundt Bakers day! And second, it's the sixth anniversary of my craniotomy. I always celebrate with a special cake. However, with the unexpected move, I had no plan in place. I decided to make the bundt the cake this year. But what to bake? The theme this month is a really good one - retro desserts. However, I couldn't think of anything that felt special enough for the anniversary celebration. I asked friends for suggestions and pulled out my mother's cookbooks from the 60s/70s. Lots of great cakes but I just could not think of how to turn them into Bundts. Plus, there are a few ingredient limitations here. One cake kept coming up over and over though - the Boston Cream Pie. I have always wanted to make one and I had all the ingredients on hand. 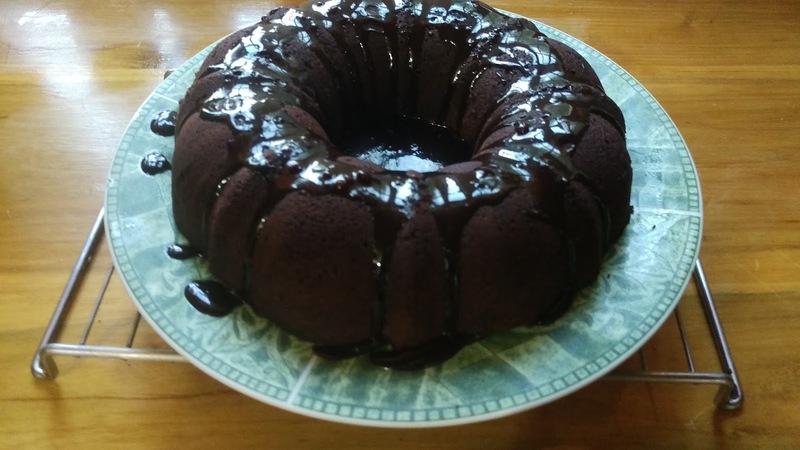 I even wrote it into the list for this month's Bundt then changed to the Tunnel of Fudge cake right before hitting submit. Bundt cakes themselves are retro and the Tunnel of Fudge cake is the cake that made the Bundt famous. Would that make it the ultimate retro Bundt? Perhaps. I should point out that I am breaking the host's rules a bit. Felice asked us to recreate retro desserts in Bundt form. I missed that key word. I honestly did not notice it until yesterday. The Tunnel of Fudge isn't a recreation since it was always in Bundt form. Sorry, Felice! I will work on a Lady Baltimore Bundt as my penance. It requires figs though and the likelihood of me getting figs here is miniscule so I'll need a worthy substitute. This version of the Tunnel of Fudge cake comes from the amazing recipe developers and testers over in America's Test Kitchen. Unlike other versions, this does not include nuts. I don't mind nuts in my cakes but I tend to skip them when I plan to share the cake with friends who may not like nuts in desserts. Happy anniversary to me! And happy Bundt Bakers day! As usual, links to all the other Bundts are below. PS. I'm still itching to do a layer cake for my anniversary cake. When I get my all baking supplies in a couple weeks, it just might happen. PPS. Is it weird that I travel with a Bundt pan and a kitchen scale? I didn't think so. Preheat oven to 350 F. Mix together the cocoa powder and melted butter then completely coat the inside of a 6 cup Bundt pan. Pour the boiling water over the chocolate chips. Let it sit for about 30 seconds and then whisk until smooth. Whisk together flour, cocoa powder, confectioner's sugar, and salt. In a separate bowl, lightly beat the vanilla, whole eggs, and egg yolk. Cream together the butter and two sugars until light and fluffy. Add the egg mixture and beat until just combined. It might look curdled. Next, beat in the chocolate mixture. Finally, stir in the flour mixture until just combined. Pour into the prepared Bundt pan and bake 30 minutes or until the edges start pulling away from the side of the pan and the cake springs back when lightly touched. Note that the centre will be fudgy. Allow to cool in the pan for about an hour then invert onto a plate and allow to cool completely. When completely cooled, whisk together the glaze ingredients then pour over cake. Be careful not to overbake or you'll lose the fudge effect. My cake here is slightly overdone. First of all, YAY! Happy anniversary, Kelly! That's always worthy of cake and a celebration. Secondly, not weird at all. If there's going to be an oven on the other end, I usually have baking equipment that comes along. It's called Being Prepared. 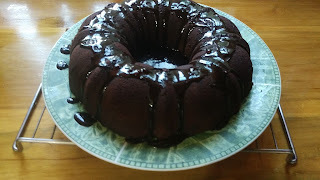 Lastly, that is one beautiful chocolatey Bundt cake! Good choice! Kelly no need to do penance at all, as your bundt looks amazing. A delicious bundt will always triumph :). Congratulations on your anniversary and a special cake is definitely in order on this special day. This looks delicious! I almost did a tunnel of fudge cake myself but I know that one of the ingredients in the original recipe is no longer available, and I had no idea that america's test kitchen had created their own version! Now that I know, I'm going to HAVE TO try this! Thank you! Happy Anniversary Kelsey. So glad we get to celebrate with you. Happy Anniversary!!! 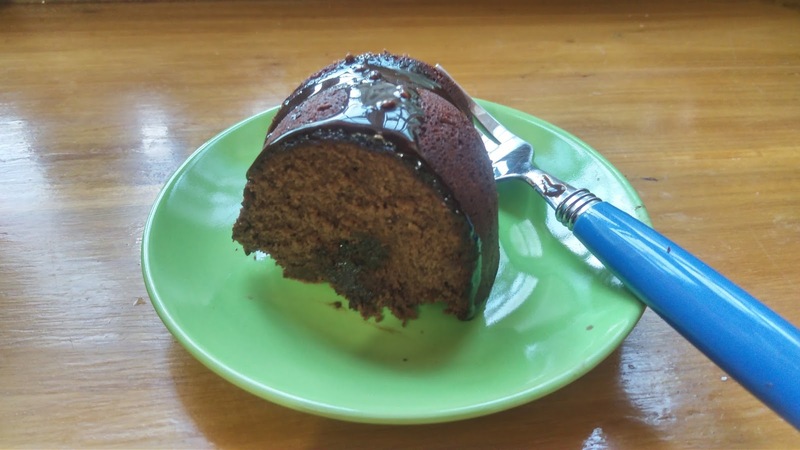 :) This Bundt is one of our favourites, with chocolate and so fudgy! Love it! This is a favourite of mine, I love them. Happy anniversary Kelly. I think it's amazing that you travel with a Bundt pan and a kitchen scale…you're a very smart woman! Happy Anniversary and thanks for baking this Bundt. It's always great to celebrate…and this is the original retro Bundt!!! it most certainly is not weird to travel with a bundt pan and kitchen scale. the people who don't? they're the weird ones. happy anniversary! Your website is beautiful, did you design it or hire someone to set you up. I especially love the ombré coloring.